Eclectic range of subjects from a range of eras. Comprehensive instructions. The range of subjects might be less obviously appealing than other manufacturers but some very unusual markings provided, unlikely to be seen anywhere else. Good value for money and well supported by documentation. These debut decals from the manufacturer Wolfpak Decals defy easy categorization. These does indeed seem to be a theme as can be seen from the sheet names above, but the subjects themselves are from a range of eras and cover a mix of types. One suspects they are represent subjects the manufacturer wanted to model and having done the hard yards decided to market them to others. F-16C+ Fighting Falcon 149th FS, 192nd FW Virginia Air National Guard 2007. A-10A Thunderbolt 354th FS 355th FW Davis Monthan AFB 2006. A-10A Thunderbolt 103rd FS, 111th FW Penn Air National Guard 2005. T-28D Trojan 606th SOS, 55th SOW, Nakhon Phanom Thailand 1967. F-4D Phantom II 555th TFS, 8th TFW Ubon Thailand 1972 – SEA scheme. F-16C+ Fighting Falcon 170th FS, 183nd FW Illinois Air National Guard 2007. A-10A Thunderbolt 357th FS 355th FW Davis Monthan AFB 2006. MC-130E Hercules Operation Eagle Claw Iranian Hostage Rescue Mission 1980. 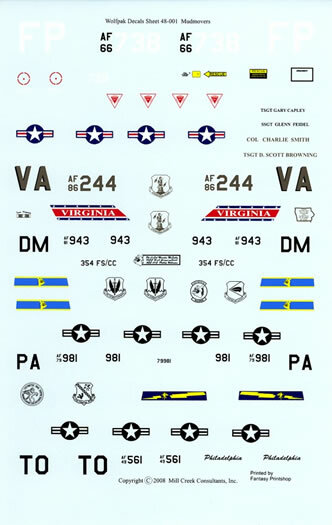 Decals provided are for unique markings and very basic stencils (stars and bars, ejection triangles). 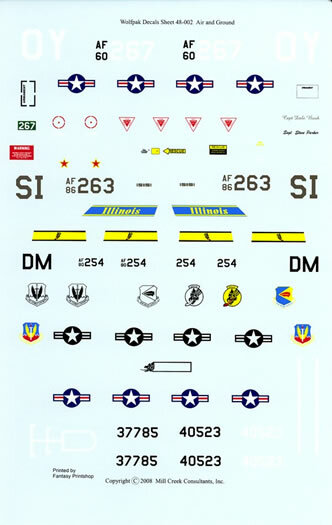 All other markings need to be sourced from the base kit or other sheets. One of the highlights of the sheets is the comprehensive instructions. 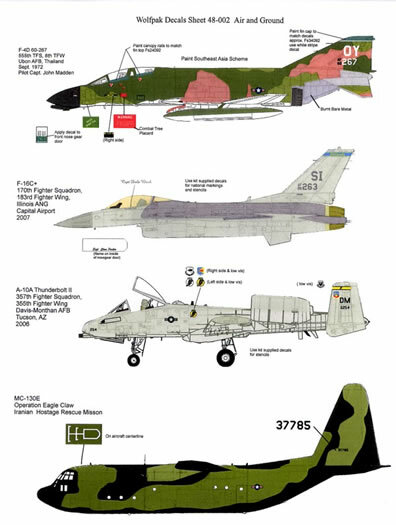 Spread over 6 A4 Pages, the modeler gets camouflage scheme diagrams, a paragraph on the history of each subject, kit recommendations, ordnance loadout charts for appropriate operations (eg OIF or Vietnam War) and detailed painting notes and FS callouts for all the little things often overlooked by others, for example cockpit interiors, wheel bays, pylons etc. Whilst the sheet is well printed by Fantasy Printshop in the UK and professionally put together by Mill Creek Consultants in Ohio, I can’t help but feel that it will have limited appeal given the eclectic range of subjects. That said it may represent the only game in town for some and anyway where else are you going to find Operation Eagle Claw markings?